YPS Valves Ltd has a reputation for stocking one of the best quality ranges of stainless steel and nickel alloy gate, globe and check valves in Europe. 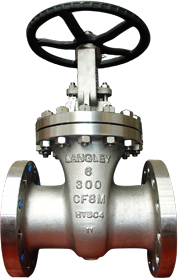 As a manufacturer and stockist of valves, we are able to combine customised design and production services with short lead times to meet the needs of almost any end user. With a global client base that includes Shell, BP, Esso, ExxonMobil, Sasol and Chevron, YPS Valves Ltd has a proven track record as a reliable manufacturer of high quality valves.